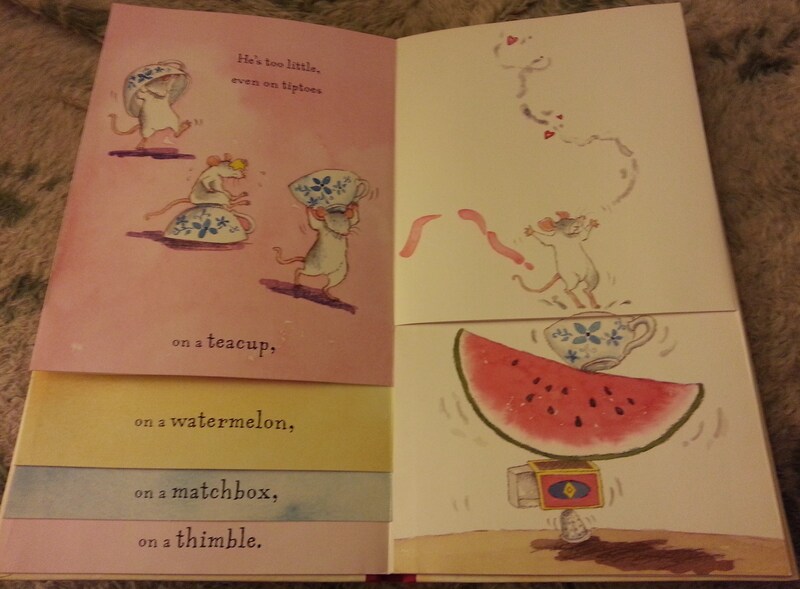 Patterns is the picture book element I chose to focus on for day four of Christie Wright Wild’s PB 14:14 challenge. 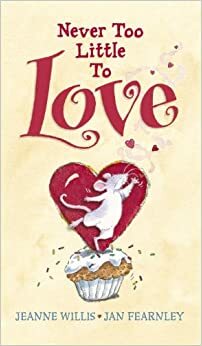 I could have posted about Never Too Little to Love back on day one, since that was Valentine’s Day and this book would be perfect for the occasion, but I figured love is a topic that can be discussed any day of the year. Let’s start with a short summary of the story: Tiny Too-Little happens to love Topsy Too-Tall. He tries every thing he can think of to reach up and give her a kiss, but he’s just not tall enough. Topsy Too-Tall loves him too, so she figures out what to do. This book is sweet and simple and uses a lot of repetition that very young children will enjoy. The back cover states that it is for ages 1 and up. The repetition is what creates the pattern, but it’s created in a unique way. The book has over-lapping pages that get smaller as the story progresses. It’s hard to explain, so I took a couple of photos to illustrate the point. You can see (hopefully) from the photos that the pages overlap and move up the left side of the book. This allows the text from the previous page to fall under the new text and be re-read in a specific order. It also allows the tower on the right side of the book to get taller and taller. 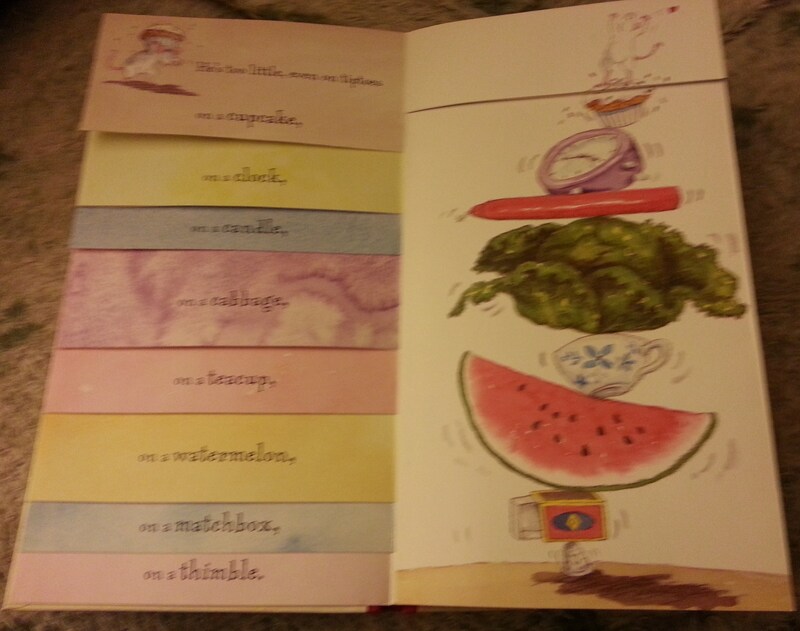 And so it continues with a cabbage, a candle, a clock, a cupcake, and stilts, until everything comes crashing down. Then Topsy Too-Tall decides she will bend down and give him a kiss instead. It’s hard to tell from the picture, but the giraffe is a pop-up. 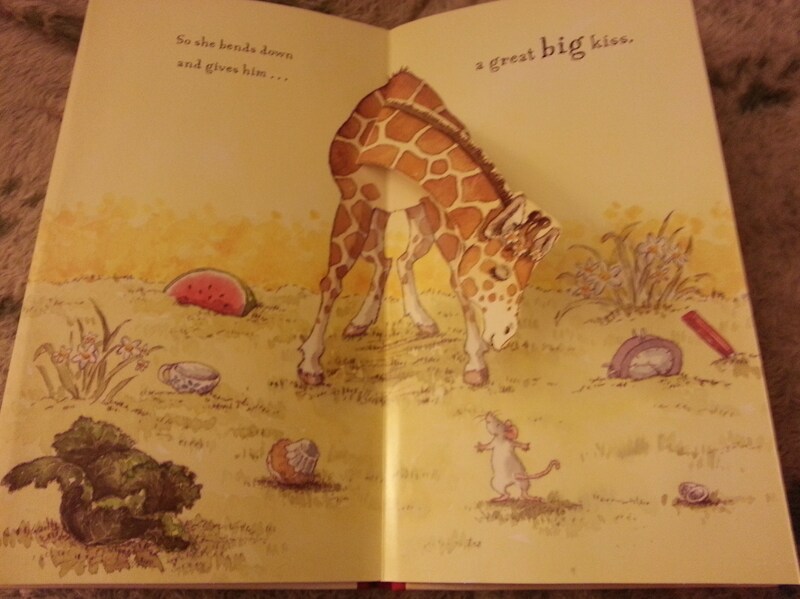 So when you open to that page, she literally bends down to give the little mouse a kiss. It’s super sweet. Lauri, Love books like this, with loads of layers that build one upon another. Great pick! Hi, Robin, I love novelty books and I especially love pop-up books, so it was a nice surprise to find a pop-up at the end of the book. Thanks for commenting! a delightful story. Thank you for your appraisal of it. I like the patterns and the build up for the mouse to gain height. I shall look for this one in the library. This book is very sweet and perfect for the youngest picture book enthusiasts. Thanks for commenting! How delightful! Sounds like something Candlewick would do, as I’ve seen others with this kind of unique construction for the sake of the story. Great review, Lauri. Thanks for the comment. Yes, Candlewick comes out with some great books!